AMMONNEWS - On an official visit to Georgia, Senate President Faisal Fayez on Monday met with Georgian President Salome Zurabishvili and Chairman of the Parliament of Georgia Irakli Kobakhidze to discuss bilateral ties. 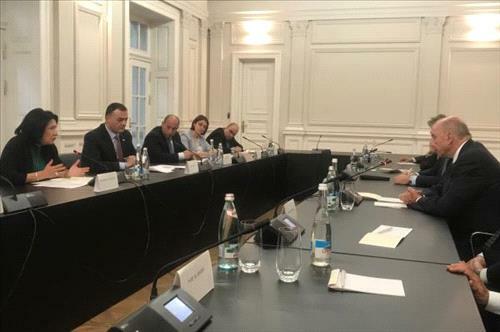 During the meeting, Zurabishvili lauded the advanced level the Jordanian-Georgian relations have reached, stating that the two countries both sides realize the grave threat of terrorism and the importance of collective efforts to combat it. She called for developing ties, particularly in the political, economic, tourism and cultural fields, and enhancing the partnership between the two countries in "a way that best serves their common interests." She also lauded His Majesty King Abdullah's role in resolving conflicts in the Middle East and restoring regional stability. Fayez discussed the latest developments in the region as well as bilateral ties and ways to develop them in various fields including investment. He said the Kingdom was able to maintain its security and stability despite being hardest hit as a result of conflicts in neighboring countries, pointing to the efforts exerted to put an end to these conflicts. He called for a partnership in the investment and economic areas especially in the tourism, energy, and public transport fields, stressing the vital role the private sector plays in building such relations. Fayez affirmed the need to end the Syrian crisis and enable refugees to return home. He also touched on the Palestinian cause stating that there will be no security or stability in the region until the Palestinian cause is resolved according to the two-state solution.